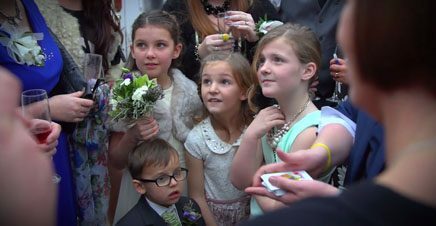 Ian & Ben’s wedding video from The Coniston Hotel in Gargrave, near Skipton. A training session with an owl is not normally the first thing you encounter on a wedding day, but Ash the owl had a very important part to play in the wedding of Ian and Ben. Family and friends came together as Ian and Ben said their vows, and were amazed as Ash delivered the rings on cue. Following the ceremony everyone enjoyed the celebrations throughout the day and into the night, with some spirited dancing accompanied by a great band. I’d like to thank Ian, Ben and their families and friends for making me feel welcome and allowing me to create a wedding video of this most special day at The Coniston. As a solo wedding videographer, I can ensure your wedding day is filmed with the minimum of fuss or intrusion, yet using the latest professional video and audio equipment. I hope you enjoy this trailer from The Coniston Hotel & Spa in Gargrave, near Skipton, North Yorkshire.